The Jünger Audio Loudness Logger is a software accessory for Jünger Level Controllers incorporating Version 2 of the Level Magic loudness control algorithm, T*AP, D*AP, C8491 and C8086+. It runs on any Windows-compatible computer and logs a comprehensive set of loudness data for real-time monitoring or subsequent analysis. The Loudness Logger is an extremely useful accessory for the latest generation of Jünger Audio’s Level Controllers equipped with Version 2 of the Level Magic loudness management algorithm; T*AP, D*AP, C8491 and C8086+. Compatible with EBU R128 and ITU.1770-2, it provides the broadcaster with a powerful tool for managing, monitoring and logging programme output in terms of audio loudness. 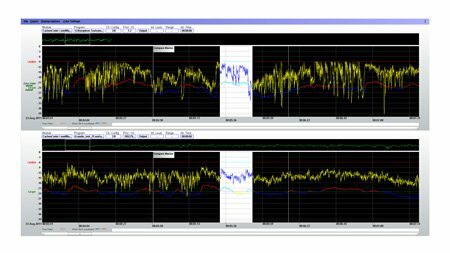 The Loudness Logger is a software package which can be installed on any convenient Windows PC, which is then connected via standard Ethernet network connections to the Level Controllers. It performs continuous monitoring and logging of signal level, loudness measurement and other data from the Level controllers, displaying the data on-screen as a set of easy-to-read, colour-coded plots. The horizontal (time) axis scale is user-selectable as is the vertical (level) axis. Instantaneous and average loudness levels are shown as well as the historical plots. All data may be saved as a set of log files, so that station output may be analysed at a later time in the event of complaint from audience, advertisers or regulatory authority. A printed report may be generated for any required time interval. The Loudness Logger is supplied on a one-licence-per-PC basis, comes with a USB dongle and is able to log loudness from 5 rack units or 2 C8000 cards.